This ship was the fifth protected cruiser to be built by an American yard. So the still a bit “green” William Cramp & Sons yard where she was ordered obtained plans left from an unsuccesful bid for the Spanish Navy from W. Armstrong, Mitchell, and Company of Newcastle. This was to be an all-around improvement on USS Charleston, somewhat larger with more guns, thicker armor, and better machinery, and reduced rigging. She also had to be equipped with modern triple expansion engine designed by Humphrys, Tennant & Co.
USS baltimore in New York – Statue of Liberty can be seen to the right in the foreground. The most striking features about the design (which also recalls the Chilean cruiser Esmeralda) was her roomy and tall hull, reduced superstructures and masts. She looked stubby in some way. All her armament was on sponsons, the four 8-inch (203 mm)/35 caliber Mark 4 guns on either side of the bow and stern and complement of six 6-inch (152 mm)/30 caliber Mark 3 guns. Initially, there was also a provision for Four 14-inch (356 mm) torpedo tubes , which were never mounted. The light artilley comprised quick-firing Hotchkiss guns in the masts tops and superstructure, including two .45 caliber (11.4 mm) Gatling guns for close support rather than dealing with early torpedo boats. The armament was alter modified. 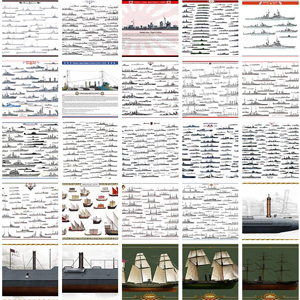 The USS Baltimore had a sister ship, the USS Philadelphia. Her cost, as registered by the navy Dpt. was $1,546,172.13. She was laid down at Cramp on 5 May 1887, launched 6 October 1888 (baptised by Mrs. Theodore D. Wilson, wife of Chief Constructor Wilson), and commissioned on 7 January 1890. She was officially registered as C3. 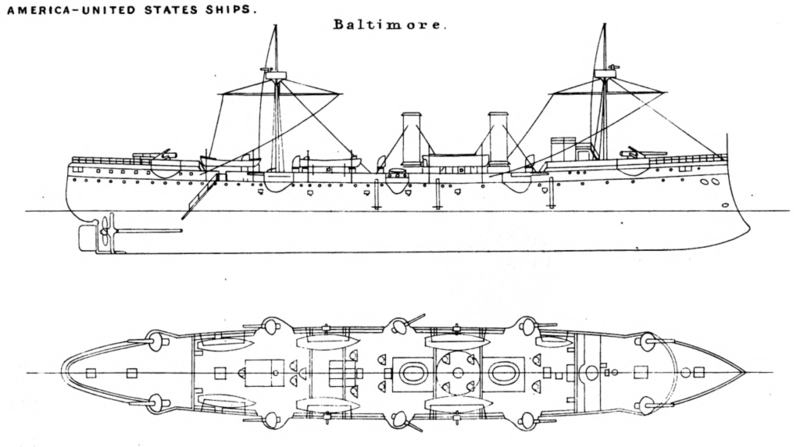 Important note: The USS Baltimore was among the first US Navy ships fitted with the new triple expansion engines. No sails were fitted and the rigging was minimal, only there to carry the tops and their small guns. The American cruiser carried some 400 tons of coal, giving a range of 3,838 nautic miles or 7,108 km at 10 knots (19 km/h; 12 mph), up to 850 tons in times of war, for 8,155 nmi. 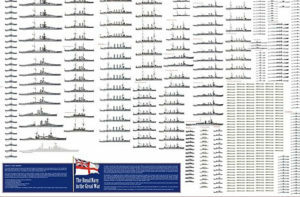 As soon as she was commissioned in January 1890, the white cruiser became flagship of the North Atlantic Squadron on 24 May. She has the honour of conveying from New York to Stockholm the remains of John Ericsson, the inventor of the Monitor, during the summer. 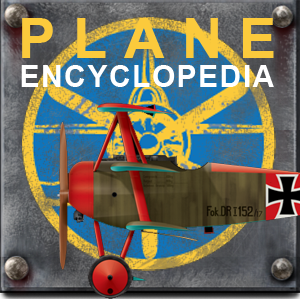 She then cruiserd from the Mediterranean to South America, stopping at Valpairso, Chile. Some of ther crew were stabbed to death at that time, the cruiser heading newspapers as the “Baltimore Crisis”. 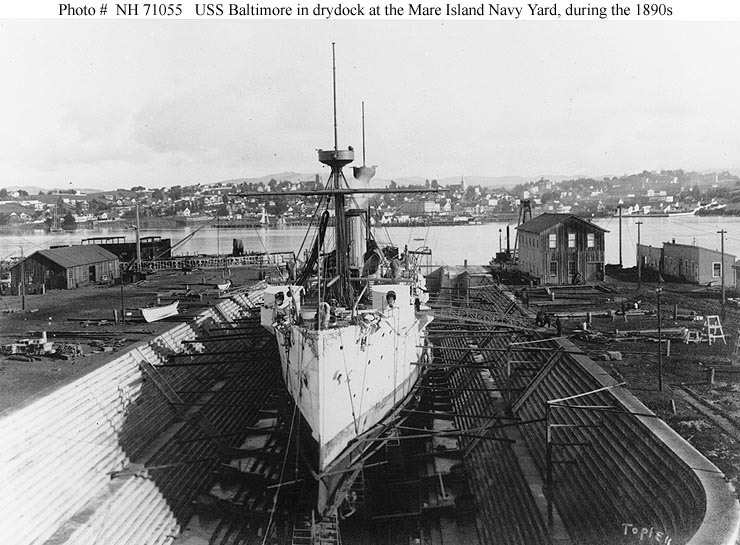 She transited from Mare Island Navy Yard to the east coast ion 1892. She departed Hampton Roads and sailed in the Mediterranean, crossed the Suez canal in 1893 to reach the Asiatic squadron. She returned home in 1896. Briefly decommissioned she sailed to the Hawaiian islands and then joined Commodore George Dewey’s squadron at Hong Kong in 1898. When the war broke out with Spain, she joined the attack in the Philippines, on 1 May she entered Manila Bay and helped destroy the Spanish fleet, as second in line behind USS Olympia. She then spent the remainder in the Philippine–American War protecting convoys and landing troops notably at Lloilo City, until returning home in 1900. Until 1903 she was decommissioned and in drydock at New York Navy Yard for refit, with 12x 6-inch (152 mm)/40 caliber Mark 7 guns, being fitted and the 8-inch guns removed and replaced by six 3-inch (76 mm)/50 caliber guns. The boilers were replaced with eight new Babcock & Wilcox models. She was back in the Carribean squadron, and in 1904-1905 was attached to the European Squadron cruising in the Mediterranean, and later until 1906 cruised in Asiatic, Philippine, and Australian waters. She was back home in 1907, and decommissioned. She was reactivated but only for the reserve as a receiving ship in 1911-1912, and taken in hands the next year to be converted as a minelayer at Charleston Navy Yard. She was given four new 6 in/40 guns and deck rails for a capacity of 180 mines. Shortly before the US entering the war, she was again modified, her guns being replaced with 5x 5-inch (127 mm)/51 caliber models plus 2x 3 inch (76 mm)/50 cal. AA models. During WW1 she performed as a training ship before being used in her intended new role, laying in succession 1200+ mines in seven summer excursions until Setpember 1917 between the Orkney Islands and Norway. In September 1919 she joined the Pacific Fleet, as CM-1 (cruiser minelayer), and stayed on the west coast, then joined Pearl Harbour before final decommission in 1922. However the story did not stop there. She indeed served as a receiving ship until December 1941, seeing first hand the Japanese attack. She survived, and was sold for scrap on 16 February 1942. However it seems she was scutted at sea in 1944 as her hull was rediscovered in September 2017 by the Okeanos Explorer. The sister-ship C-4 (later IX-24) was the sixth American protected cruiser, laid down 22 March 1888 and launched on 7 September 1889, to be commissioned after trials on 28 July 1890. She was decommissioned as a cruiser 22 September 1902 and spent the rest of here career partially and then completely disarmed as a receiving ship, and prison ship. When fitting out she became the flagship of Rear Admiral Bancroft Gherardi, commanding the North Atlantic Squadron. In 1891 she cruised the West Indies and was back to Uruguay. 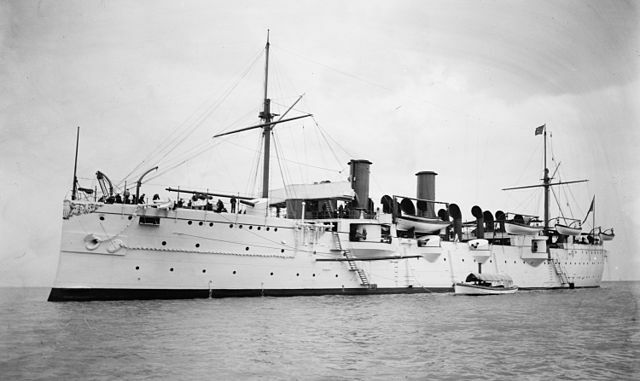 She was at Hampton Roads on 8 April for a large naval review before the president until 1893 and then joined the Pacific Squadron via Rio de Janeiro, Brazil, and Callao, Peru. 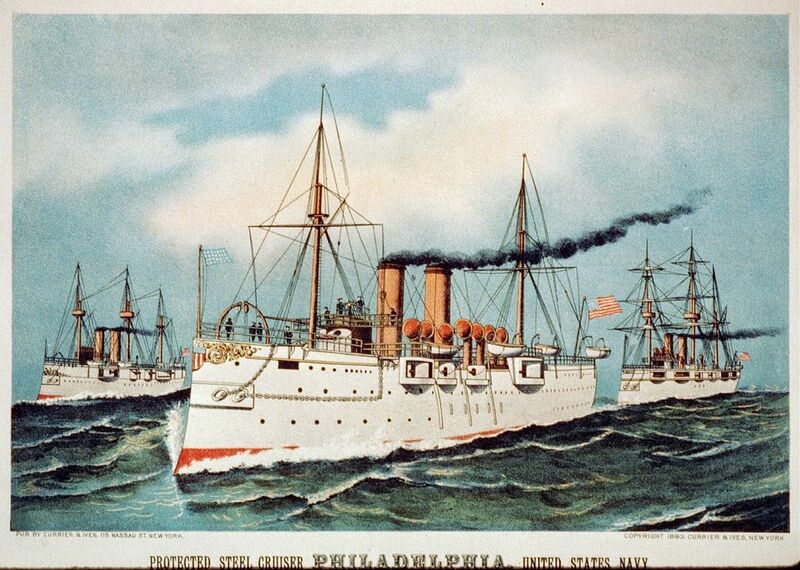 She was stationed at the Pacific Station from 1893 to 1902 as flagship of the Commander-in-Chief. She was present and represented the US Navy at the ceremonies transferring the Hawaiian Islands to the United States in 1898. In 1899 she was stationed at the Samoan Islands. She arrived San Francisco 17 July 1902 her hull needed much repairs and refit, so she was decommissioned instead at Puget Sound 22 September 1902. She was eventually a receiving ship again on 10 January 1916, and was redesignated hull number IX-24 on 17 July 1920, and stayed as such until struck from the Navy List on 24 November 1926 and broken up the next year. 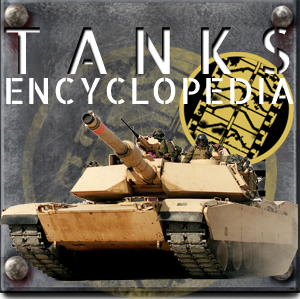 Armament: 4 x 8in (203 mm), 6 x 6in (152 mm), 4 x 3in (75 mm), 2 x 3-pdr (47mm) and 2 x 1-pdr (37 mm), no TT.